Industry professionals, big data enthusiasts, academics and students congregated at the latest edition of the Colombo Big Data Meetup held recently at the Virtusa auditorium. Powered by Virtusa, the interactive sessions apprised participants of the latest developments in Big Data tools and technologies. 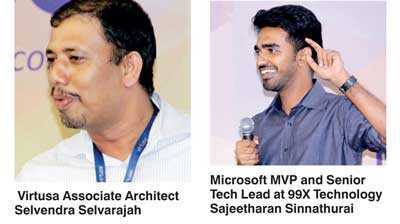 Virtusa Associate Architect Selvendra Selvarajah and Microsoft MVP and Senior Tech Lead at 99X Technology Sajeetharan Sinnathurai delivered the keynote addresses of the evening. The session kicked off with a presentation by Selvendra Selvarajah on the increasing use of R programming language in industry. A leading open source programming language consisting of powerful functions to tackle all problems related to Big Data processing, it has been used only in academics, historically. However, recent developments have seen it being more commonly used in industry. Selvendra believes this latest trend will make Big Data analytics easier for most programmers as it eliminates the requirement for fresh graduates to learn a new programming language or use another program. Additionally, the open source nature of the language allows it to be continuously developed with improvements being freely available soon after. “Microsoft has begun including R language in their development process making it more popular than ever. This makes the lives of programmers that much easier as they can directly apply what they learn in university to real world situations. The ready-to-use statistical modelling algorithms and machine learning nature of R language help speed up the process as well. This makes R language invaluable for analytics driven companies and essential for those looking to create value from stored data,” he said. Sajeetharan Sinnathurai came in next and delved into the practical applications of sentiment analysis. He took the audience through the different steps involved in building a sentiment analysis solution using the Azure platform. A live demo was run to extract data from Twitter and, with the participation of the audience, sentiment analysis was applied on the resulting data. Sajeetharan believes that in an age where social media can have a profound impact on a business, sentiment analysis can help businesses better understand their customers. It can guide market strategy, assist crisis management, influence product development, help monitor brand reputation, and be utilised for competitive benchmarking as well as inform a host of other business outcomes. “The key to business has always been knowing what your customer wants and at a time where customers are constantly updating their social media with their thoughts and emotions that information has never been more accessible. However, unlocking the hidden value of that raw data can be tedious and overwhelming if we were to do it manually by reviewing every post ourselves. This is where solutions provided by platforms like Azure come into play. With the implementation of Azure Logic Apps, Text Analytics API, Azure SQL DB and PowerBI we can harness powerful insights from a single country or across the globe quickly and easily,” he said. The Big Data meetup has been taking place each quarter since 2014 with the participation of many industry professionals and academics. The event has proven popular amongst its target audience with the community growing to almost 3000 strong. Having recognised this as a great platform to bring enthusiasts, students, academia and the industry together and engage and update them on the latest in the world of Big Data, Virtusa has been an active part of this forum, right from its inception. Tharindu Buddhika, Senior Software Engineer, Commercial Bank of Ceylon PLC, has been an active member of this community and a key organiser of the event since its inception. He believes that the popularity of these sessions can be traced to the fact that it bridges the gap between academics and industry. It fills in that additional bit of knowledge that fresh graduates need when joining the IT industry while giving veterans in IT the opportunity to keep abreast of the latest trends. “When we started these sessions about four years ago Big Data was only an emerging field but we knew right then that it would play a big part in IT simply because at that time in history there was more data being created and collected than ever before. This meant that Big Data analysis would have a wide array of applications across several industries and if Sri Lanka wanted to be a part of this emerging trend then we needed to get our IT professionals and undergraduates thinking and learning about Big Data. Hence we began these meetups as a way of spreading the message but it soon grew into something more – a community that allowed us to share our thoughts and insights on the subject,” noted Tharindu. He also believes that these sessions play an integral part in making Big Data popular within the local IT industry. For more information on the Colombo Big Data Meetup and to stay informed about upcoming meetups check out their Facebook page at facebook.com/ColomboBigDataMeetup.